Meat Trades Journal's Aidan Fortune with Carmen Kirk, John Kirk, Andrew Kirk and Maureen Kirk of Kirk's Butchers. 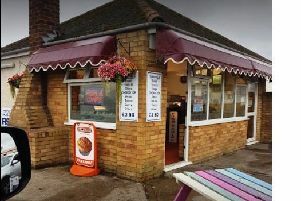 The steaks were high for a Skegness butchers as they waited to find out if they were to be crowned the best in the country. But there was certainly no ‘poultry’ amount of competitors from around the UK who were also in line for the same ‘Butcher Shop of the Year 2018’ gong. Thankfully, Kirk’s proved to be a ‘cut above’ the rest - by winning the title at the Meat Trade Journal’s awards. Owner Andrew Kirk said he was overjoyed to have been crowned the best in the country - and praised his staff. “It’s a testament to our entire team and the hard work put into the business,” he said. At the packed event held in London last week, 13 categories were decided, with one of the regional category winners announced as Butcher’s Shop of the Year 2018.